← August Weeks 1 & 2 – Deeper wisdom in simple things. Photographers can create a variety of abstract images via Photoshop techniques and the application of various apps. But I still highly enjoy creating an abstract image in-camera with a single straight capture. And, believe me, there are all kinds of in-camera techniques that can enhance a shot, such as varying the depth-of-field, moving/zooming the camera at a slow shutter speed, doubling/multiplying exposures or over/underexposing, etc. 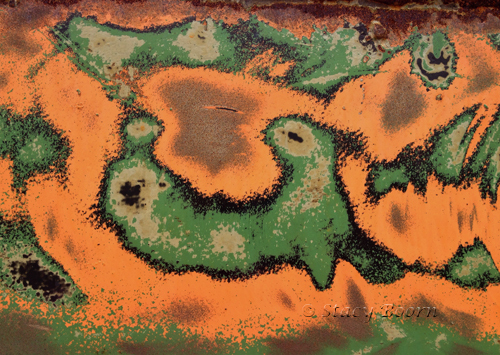 Rust and layers of peeling paint are among my favorite abstract “canvases.” I found lots to work with when I came across a dock worker power-washing huge metal dredging equipment in Crescent City along the northern coast of California. The worker’s task was to de-slime the large trough-like metal beams and remove the barnacles from them. At the same time, chipped-off layers of paint were sporadically revealing multiple colors underneath. Whose art is this anyway? 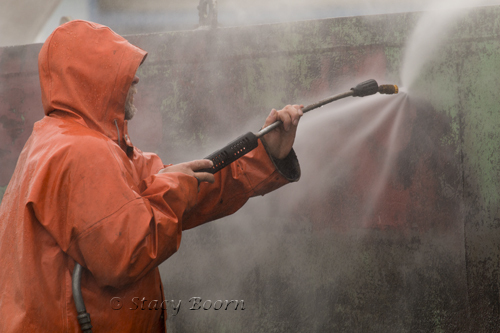 The power wash was leaving unintentional patterns that the dredging process in the Crescent City bay began. But without a photographer and her eye, the shapes would never have been abstracted from the project. And what shapes they were, creating a cross between the work of Jackson Pollock and Picasso. Perhaps this is collaborative art with the major contributors being the dredging equipment, the ocean, the power wash, the sea air and me! I circled the six foot high, thirty foot long and four foot wide massive piece of steel seeing one abstract, distorted, mystical and playful image after another. Some were just 6 inches by 4 inches while other pictures were measured in feet – a laughing rabbit in one spot and a dripping pink cloud in another. It is amazing how everyday tasks present us with magical scenes. Through them we can connect to fantasies that can both entertain and teach us life-lessons. Here are just a few images that did that for me. Usually I think of my art as “my” art. But perhaps in all that we do we are more enriched when we are producing something as a collaborative effort. This is not a lesson that came easy or naturally to me in either my avocation or vocation. But finally I am catching on to the wisdom of multiple voices, many hands and ideas from all over the map having great potential for both creativity and community empowerment. Addressing and solving global warming, growing violence, human inequities, and water, carbon, energy and food security challenges — we cannot do this alone . A colossal team effort is needed from individuals, faith/spiritual communities, business, government and civil society to tackle the life-threatening concerns we all face. Given the sheer complexity and global nature of these issues, the response must be global, and, to be effective, it must happen at scale. How we collaborate will have profound implications for how we live now and into the future! 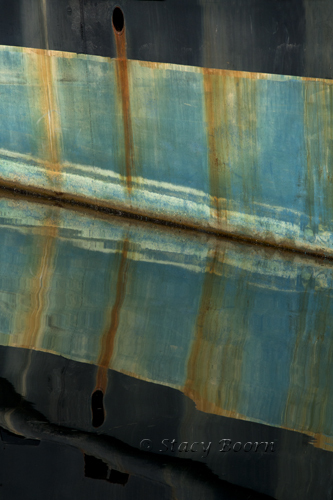 This entry was posted in Weekly 2 and tagged abstract images, abstract photography, Collaberation, creative photography, Crescent City, Stacy Boorn. Bookmark the permalink.